After a recent purchase of a new toy (a large Le Creuset casserole pot), I can’t help but play around with it and try new recipes and ways of cooking things. Heat the oil in a large pot. Quarter the shallots, cut the bacon into slices and place both into the pot. Cook on a medium heat until the onion browns. Remove the onion and bacon from the pot, and put to the side. Place in the chicken, and brown all over. This process should take about 5-10 minutes. Put this to the side as well. Chop up the garlic, add to the pot with the chopped leeks, carrots and parsnips. Cook for about 3 minutes until tender, then add the sliced brocolli and mushrooms. Re-add the bacon and shallots, then the chicken. 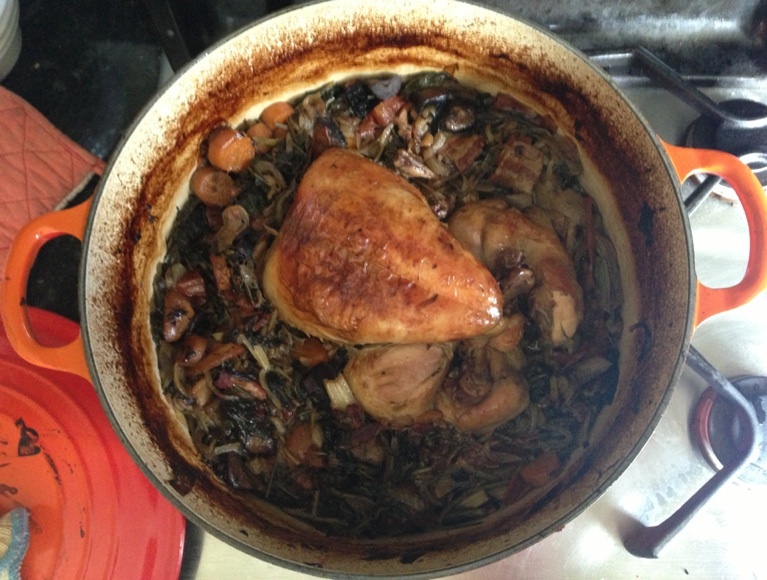 Pour in the stock and wine until it almost covers the chicken, and cook until it simmers. Put on the lid, and place the pot in the oven. Cook for around 110 minutes (20 minutes per 450 grams + 20 minutes of chicken). Serve with crusty bread, and the remainder of the bottle of wine you used for the stock (so I recommend using a fairly drinkable one). The vegetables I’ve noted here are the usual ones I throw into the pot. Whenever I make this dish, I never use the same amount, or even the same vegetables. I recommend using what’s in season. Adding a few tomatoes usually adds quite a nice flavour to it, and try using red wine instead of white as well. The chicken I recommend to be organic and free range. I know that this does up the expense, but the price per serving is quite low and it does add excellent flavouring. Very good written article. It will be beneficial to everyone who usess it, including myself. Keep doing what you are doing – can’r wait to read more posts.